A few weeks ago, I received a very generous shipment from Michigan Asparagus. It was part of #BrunchWeek. I used it to make a very yummy brunch-ish frittata. To my own benefit, they sent so much- I couldn’t possibly use it all in one place. Luckily, I was able to put the surplus to good use! 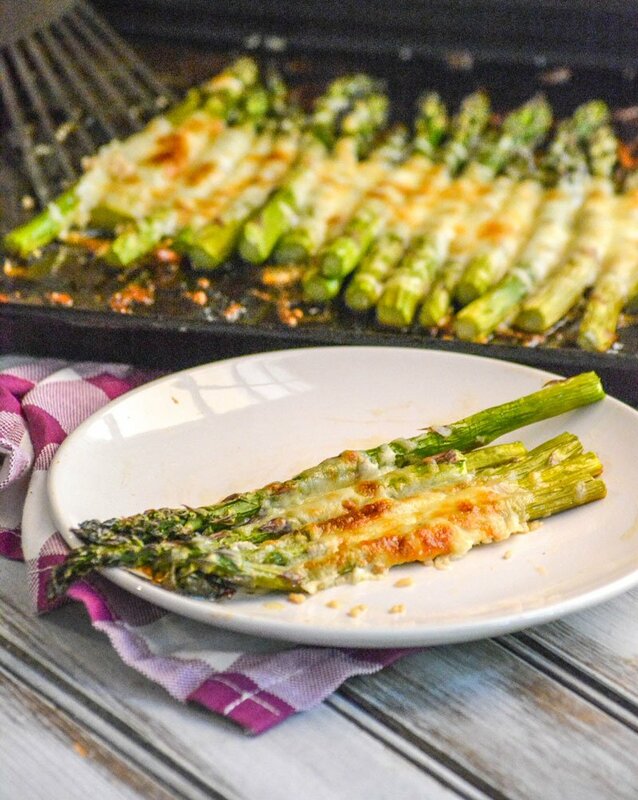 We made an absolutely delicious Grilled Caesar Asparagus with it for Grilling Week. It’s a perfect side dish for Summer, and to pair with grilled- pretty-much-anything. We couldn’t stop there though, especially coming from a family that previously had refused to even try the green stalky veggie. Sadly, without even trying it, we were firmly convinced it wasn’t for us. Over the course of our lifetimes, yeah- the Hubs & I had each sampled asparagus, but in no dish that ever won our hearts over, or even made it feel luke-warm for us. Since my journey began with cooking for a living though, it forced us to re-try some of those previously no-go veggies. I mean just because we weren’t fans, didn’t mean all of you guys following along didn’t love them. We had a duty to bring you some tried and true new ideas. 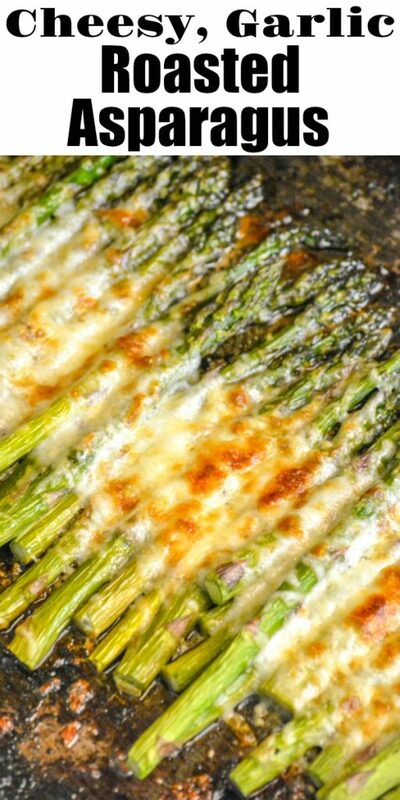 Not so surprisingly to others, but to us, when cooked right- things like asparagus are freakin’ amazing! 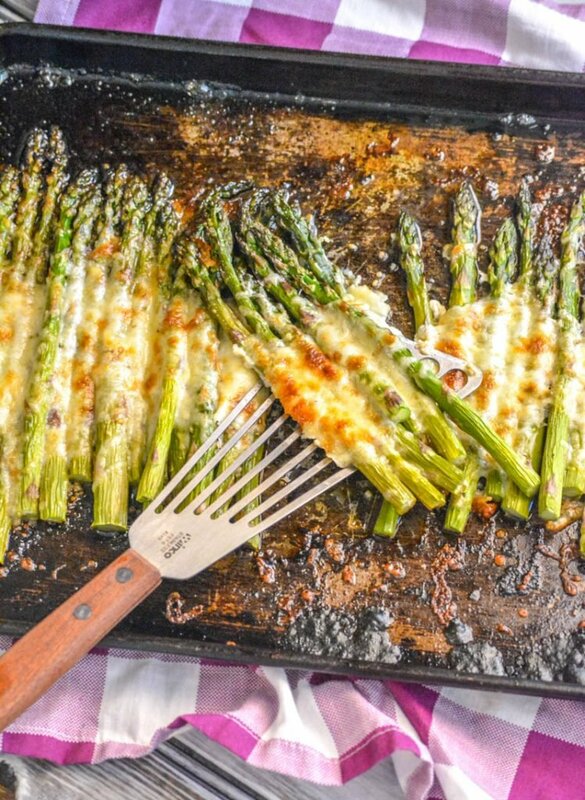 This Garlic Roasted Cheesy Sheet Pan Asparagus is super simple. Promise! It doesn’t get any easier. A little olive oil, a bit of garlic, a liberal seasoning of salt & freshly ground pepper- that’s all you need to make some of the best roasted asparagus you’ll ever need. All made on one pan to boot! 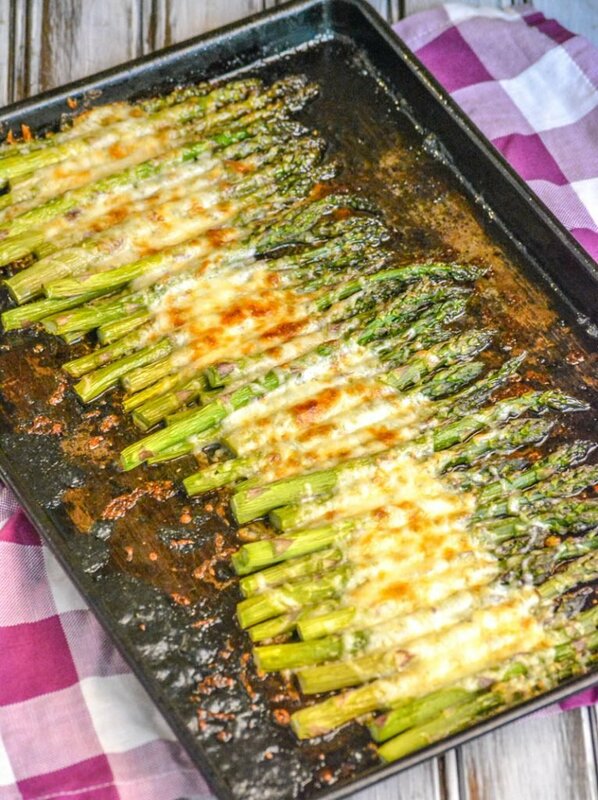 Sprinkled with a blend of mozzarella & Parmesan cheeses that are melted and broiled to golden brown, bubbly cheese perfection- this Garlic Roasted Cheesy Sheet Pan Asparagus is bound to be your new go to side dish. Love it or hate it, 20 minutes is all you’re gonna need to discover how much you were missing out on with this particular green veggie. 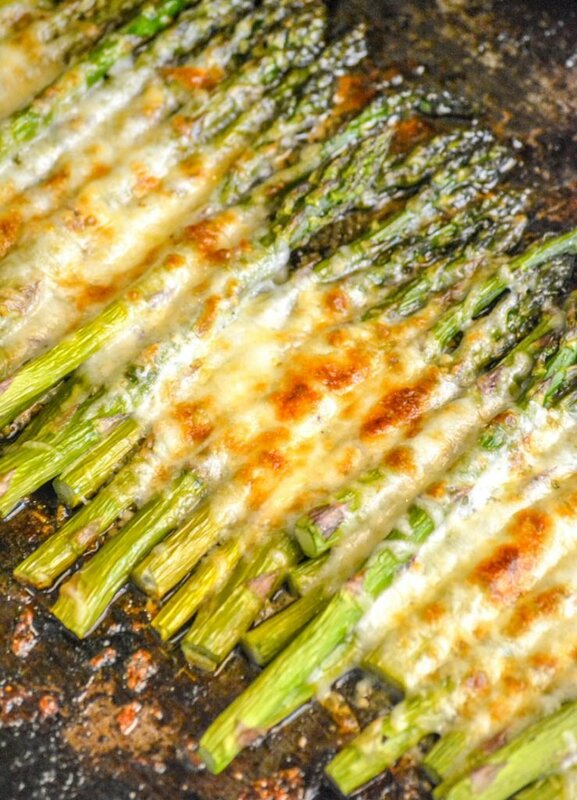 An easy side dish, this roasted garlic asparagus is cooked on a single sheet pan with a cheesy topping. 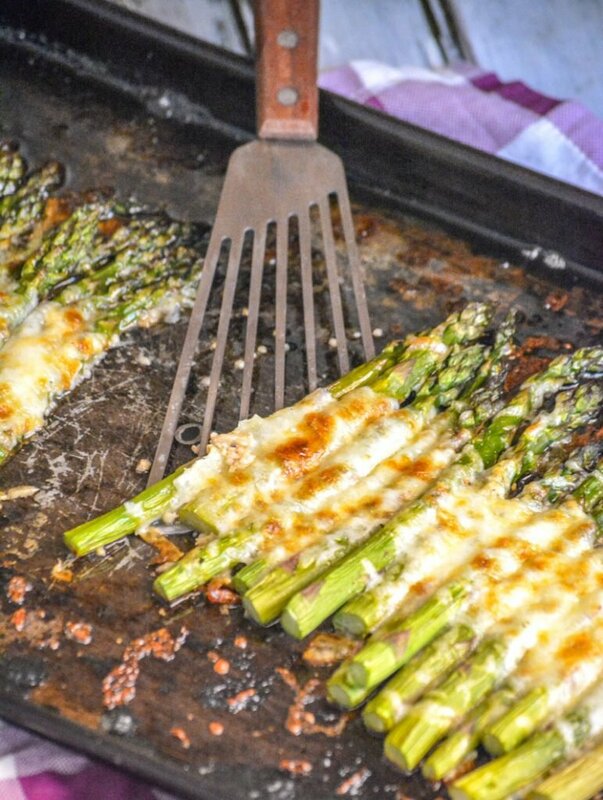 Spread the asparagus, evenly, in a single layer on a large sheet pan. In a small bowl, whisk together the oil and garlic until evenly combined. Pour the mixture evenly out over the veggies. Using your hands, toss the asparagus just until completely coated. Spread back out into an even, single layer. Liberally salt & pepper the asparagus. I recommend more freshly ground black pepper than salt. Bake at 425 for 15 minutes, or until the asparagus has become tender, but not yet wilted. 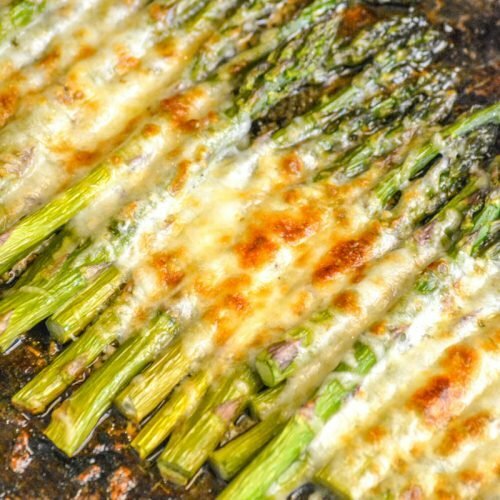 Carefully take the pan from the oven, sprinkle the cheeses evenly out over the asparagus. Return to the oven, baking an extra 2 minutes, or until the cheese is completely melted. Turn the broiler on, and broil just until the cheese bubbles and begins to turn golden brown. Aparagus… one of my favorite veggies! Always fun to find new ways to prepare it! Thank you for sharing at the Fiesta Friday table! FIVE STARS!!! Best fast asparagus recipe ever!! So good and easy to make! Thank you!